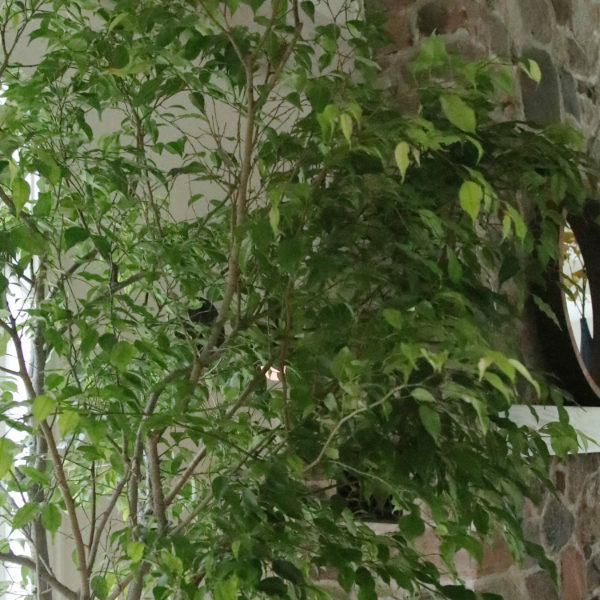 A quick note before we get into a makeover I’m really excited about: This post is a paid partnership with Lowe’s Home Improvement, but you know how I roll on these things: You always get my honest opinion whether you want it or not! Part 3: Ekk! The garden has turned into a jungle. Must get it back in shape! Part 4: Summer is waning. Don’t be ridiculous. 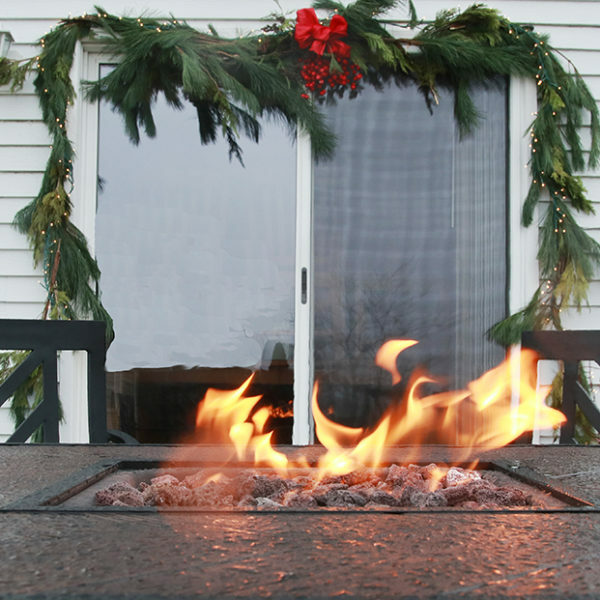 Sit down, relax, enjoy the company of family and friends and soak it all in. Well, I’m very happy to report that I’m officially into Phase 4. 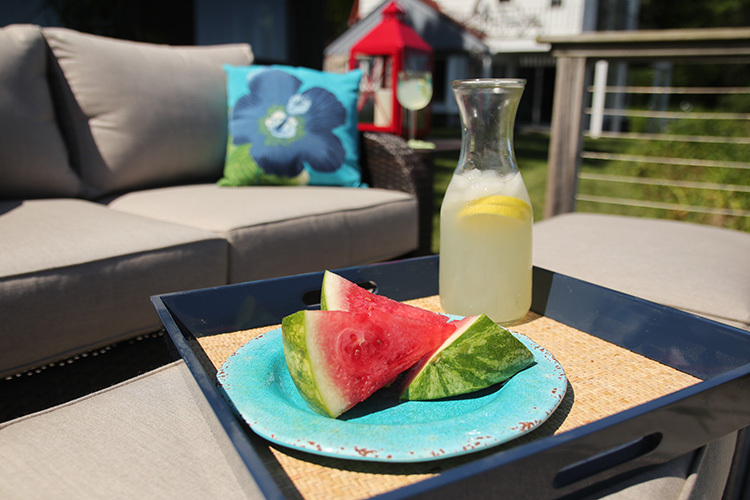 It’s time to take it easy and enjoy summer. 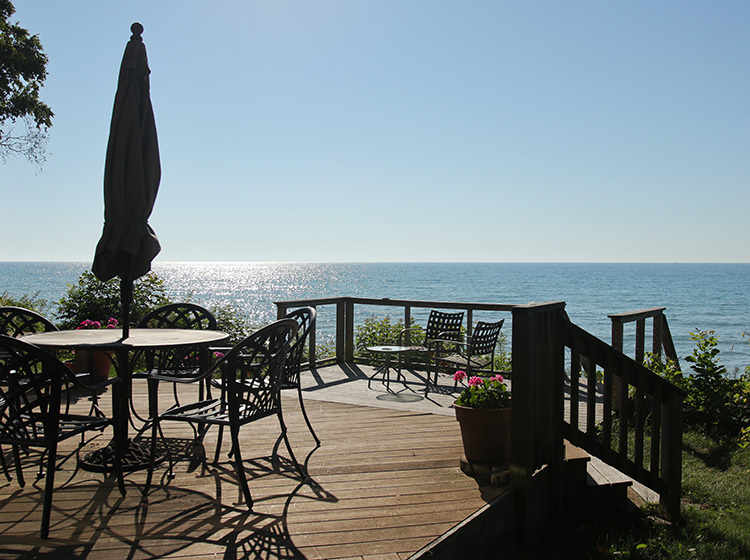 When I’m really in summer mode, I go to the place where I spent summers growing up: a family cottage on Lake Michigan that happens to be just down the road from our house. The place—a modest cottage that my dad helped his father finish the inside of as a teenager—is shared by four extended families, so there’s always someone there. Sometimes it’s just a couple of people but a lot of times there can be dozens of people there. Here’s what the deck looked like before I turned up the color and comfy on it. Beautiful view, but not the most comfortable space. 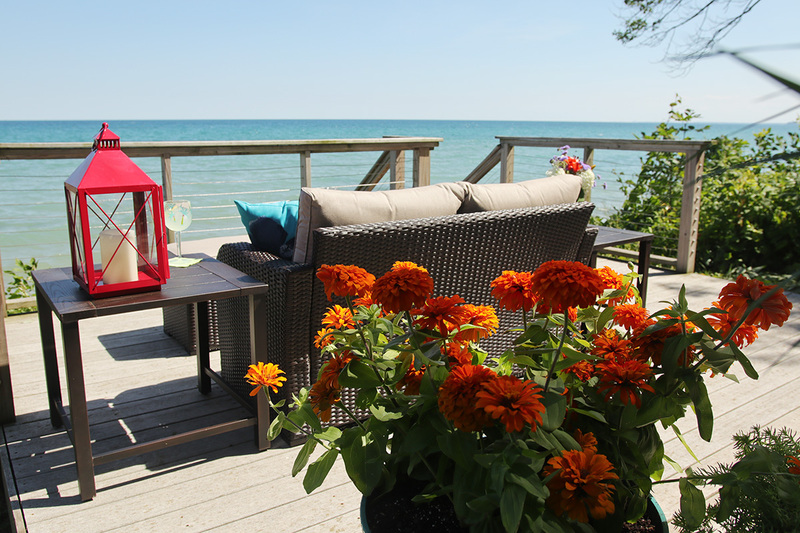 Because it’s a cottage, a lot of times the furnishings, particularly the outdoor variety, are leftovers from someone’s house. It’s hard to justify spending a lot of money on things that are used for four or five months a year and that you know are going to take a beating from weather, parties and just lots of people of all ages using them. But here’s the thing: Why would we have that attitude when this is the place where so many people in the family go for the best moments of the year? I mean, you can have fun and be comfortable, right? You bet you can! 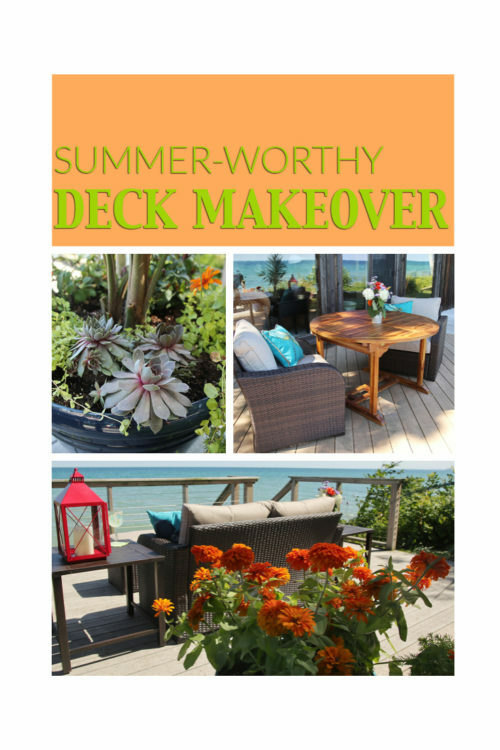 So I decided to do something about it, in the form of a deck makeover. 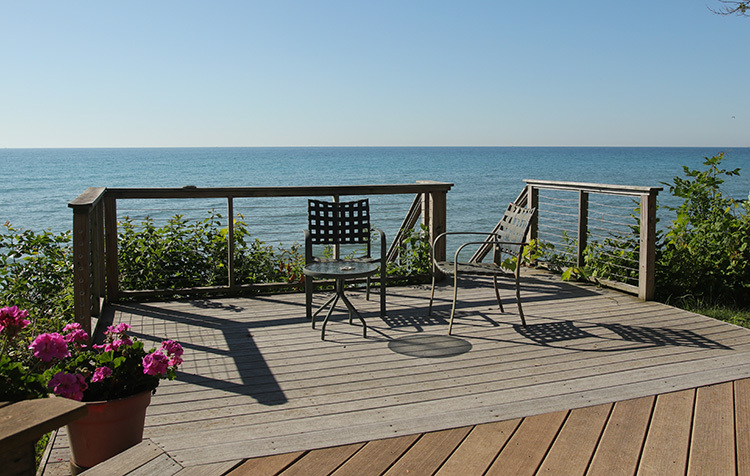 I mean, if you have a deck with an amazing view of Lake Michigan why wouldn’t you want to be on it all the time? Be careful sitting in these old pre-makeover chairs. More than one person has had the unfortunate surprise of crumpling to the ground in one! If you don’t believe me about the state of things on this deck, allow me to show you. Note the rusty chairs (more than one person has sat in one only to crumple to the ground in a pile of rust), less than attractive table and general lack of seating for a crowd. Since this space is used in so many different ways for such a variety of group sizes, it was really important that it was flexible enough to work no matter what the occasion, from a big holiday party to dinner for a handful. 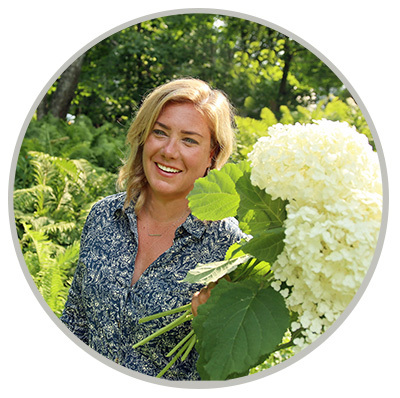 The items I chose from Lowe’s for the makeover were all based on flexibility; it can all be moved around and reconfigured for whatever is needed. There are two levels to this deck, with a staircase that leads to what used to be the beach but is now a direct shot straight into the lake because the water level is so high. The tiers make it easy to delineate a dining area and a lounging area, although the two certainly blend together for a crowd. 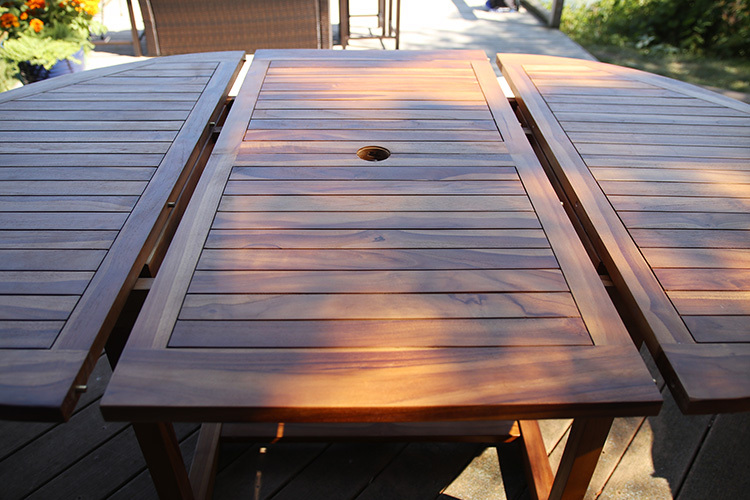 The teak table is at the heart of the upper level of the deck. It all starts with a table, that lovely surface upon which food and drinks will almost constantly be served, children will color in coloring books and beachcombing finds will be sorted. 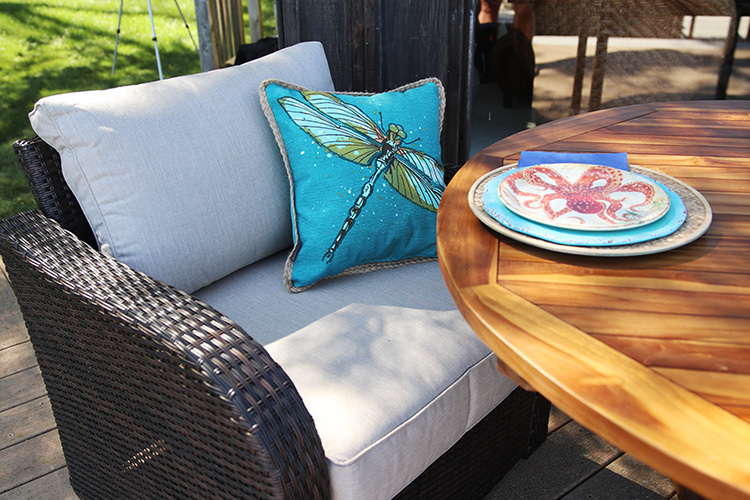 I like this teak table because it can either be used as a 48-inch round table or opened with a butterfly leaf to a 72-inch long oval table with room for many. I also love how teak grays out (although you can always oil it to keep it looking fresh), so I think it will only get better looking in this space. 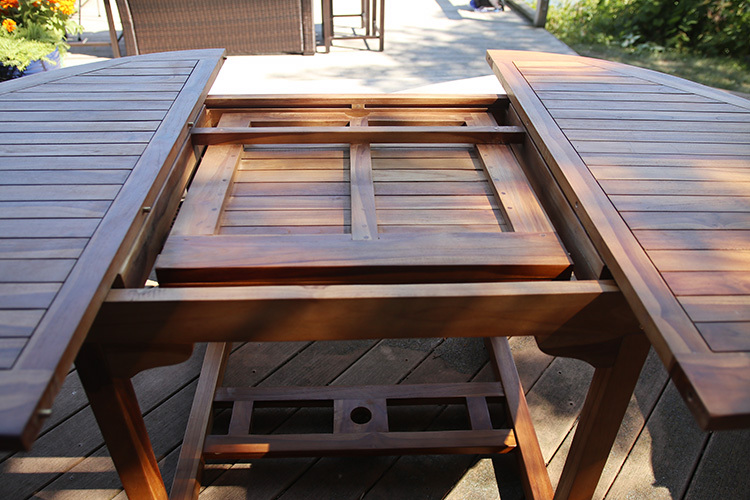 The table leaf is built in. To turn the big, oval 72-inch long table into a 48-inch round you just pull the ends, then fold the butterfly leaf in and push the ends back together. 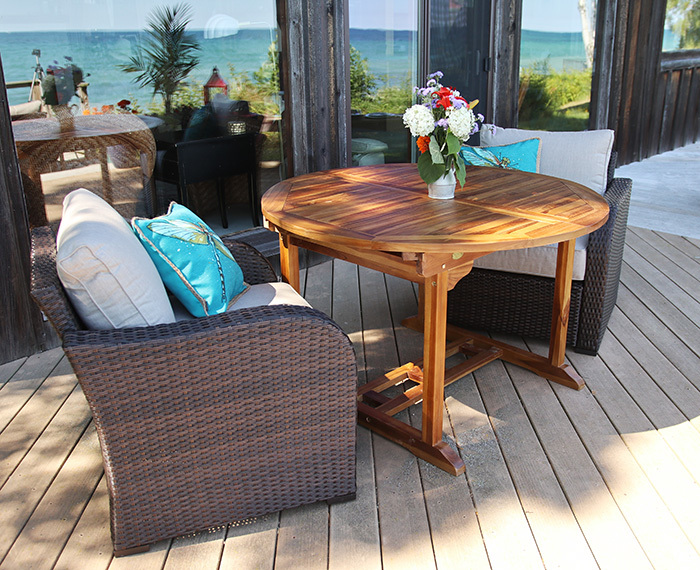 The 48-inch round size is perfect for dinner for two to four people or when we need more standing room on the deck. After that it’s about comfort. I’ve decided that I’ve officially aged out of hard chairs. If I’m really going to be relaxing, I need some cushions. And let me tell you, the five-piece Norborough Conversation Set has some serious cushions; the kind you can sink into with a good book for hours. This set is perfect for this space. 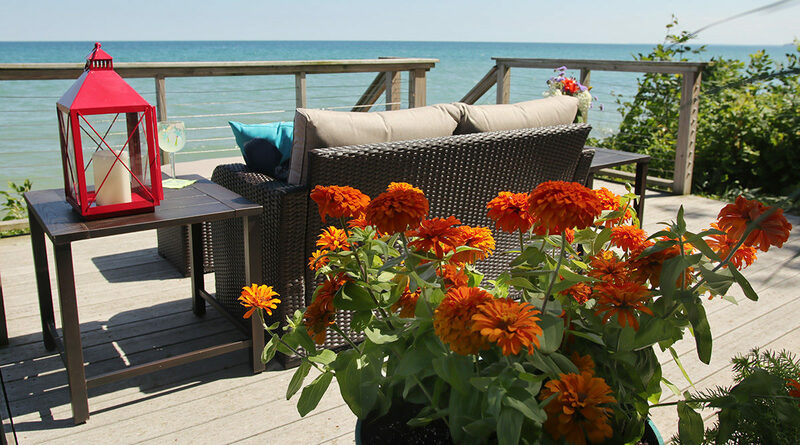 It has aluminum frames and weatherproof “wicker” (all necessities for a lakeside location) and thick, Sunbrella-covered outdoor cushions that will resist mildew and sun damage so it won’t be a big deal if they aren’t brought in every time it rains. The cushion color is called “cast ash,” but they are a grayed linen color that will work with just about anything else. The loveseat and ottomans work great for a smaller seating area on the lower level or could be pulled up to the table. With two chairs, a loveseat and two ottomans, I can see this working in so many different ways. The chairs will be excellent head chairs for the table (we have oodles of stackable side chairs kicking around the cottage for other seating), and the ottomans can be used as benches at the table. For that matter, the loveseat could be pulled up there too. 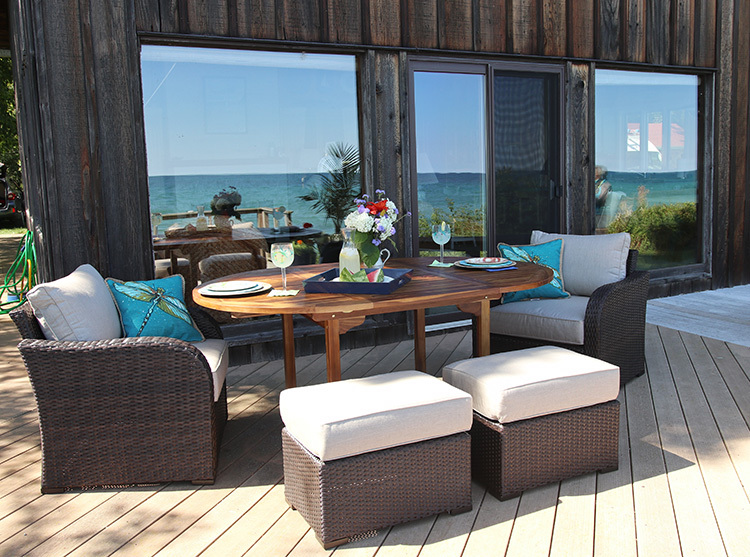 But when it’s all about lounging, the whole set can move to the lower deck for an amazing conversation area or we can keep the chairs at the table and the loveseat on the lower deck to keep the entire gang happy. I will tell you that I gave that loveseat a serious trial and that plus an ottoman is basically heaven. It’s nice to have a really neutral backdrop to be able to play up any color you want in accessories and I was really feeling a tropical vibe. Since this is clearly not a tropical location, I can only blame my desire for hot oranges and cerulean hues on what I call summer euphoria. The linen color of the cushions is perfect to pair with any color and I loved all the outdoor throw pillows in shades of blue and turquoise. 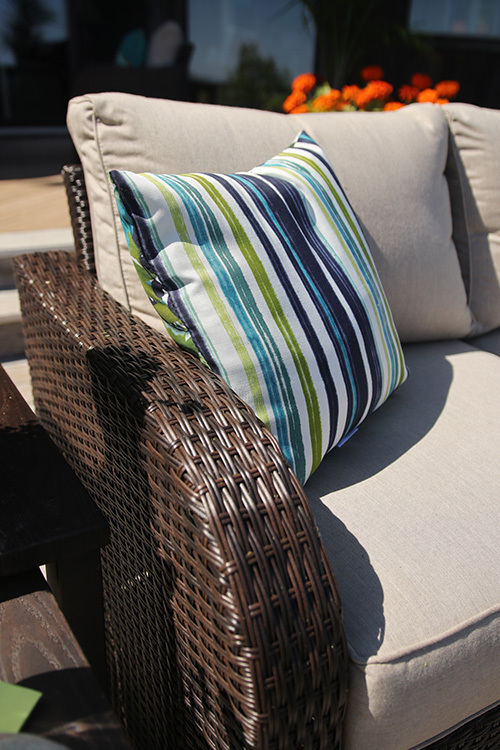 Lowe’s has a pretty amazing collection of outdoor pillows that helped brighten the whole area up. Add to that a set of metal nesting tables that can be used as side tables or a coffee table when the ottomans are at the dining table. I love that hibiscus pillow! Maybe the best part of this makeover (besides trying out that loveseat) was the chance to plant up more containers. It was actually a really fun challenge because it can be hard to find plants in midsummer and you have to get a little more creative. 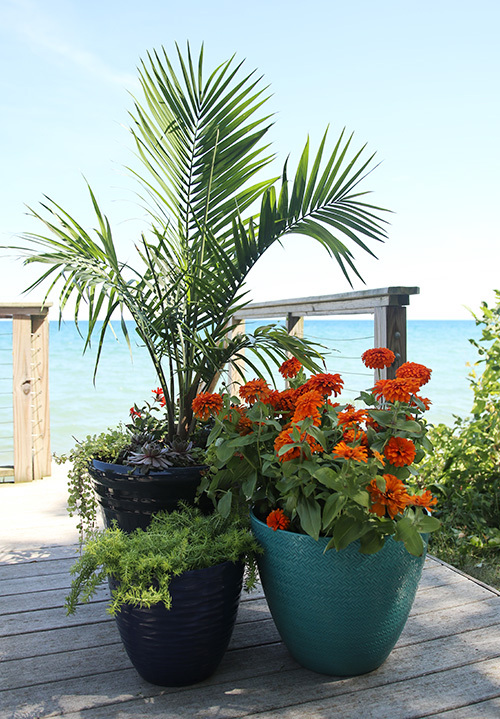 I loved the pots I found at Lowe’s, a collection of blue and turquoise with interesting textures and frost-proof so I don’t have to baby them in winter and immediately gravitated to a colorful, tropical palette of plants to fill them. This trio of containers was all about a tropical vibe. And it was so fun to do more containers in the middle of summer! For the largest container I used a tropical houseplant as the centerpiece and then filled the area around it with a pair of Lychnis x haageana ‘Molten Lava’, a perennial with fiery orange-red flowers, a sea of creeping Jenny and, just for fun, a little cluster of purple hens and chicks sedums. 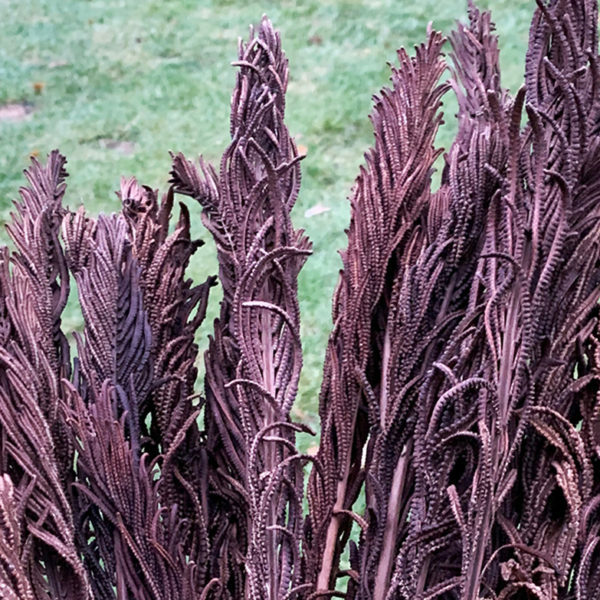 Normally planting sedums with other plants might not work as the required soil conditions are different. 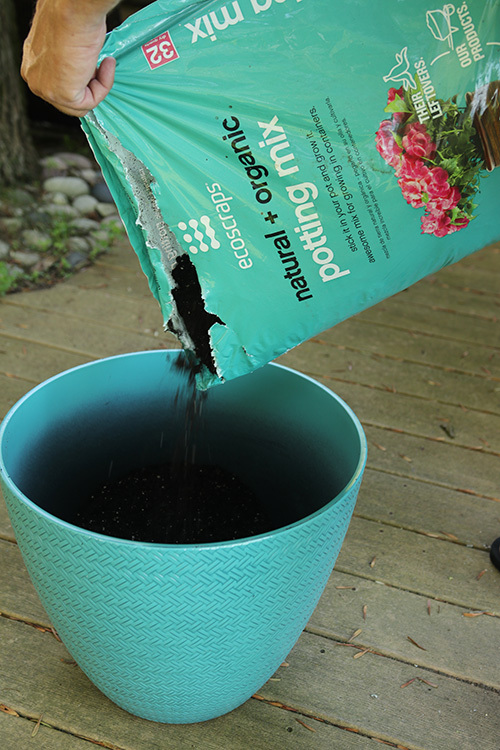 But I fudged it a bit by mixing some very fine pine bark mulch in with the Ecoscraps potting mix (it’s a good way to lighten soil if you feel like it may be too heavy) in the area where the sedums will grow to aid in drainage in that area. Keep in mind, these containers will only have about two months to do their thing so it’s not long-term commitment. Check out the cool texture on that pot! The middle-size container is my favorite. I put three amazing big orange zinnias in this gorgeous turquoise container, a color combo I’ll never stop loving. 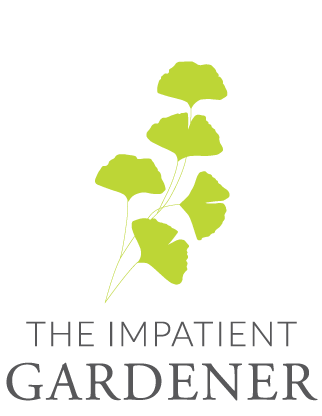 Never underestimate the power of a mass-planting of one plant in a container. I had so much fun putting an unlikely pairing of plants together. Sedums, creeping jenny and Lychnis don’t usually go together but these plants will only grow together for a couple months so I had a little more freedom. 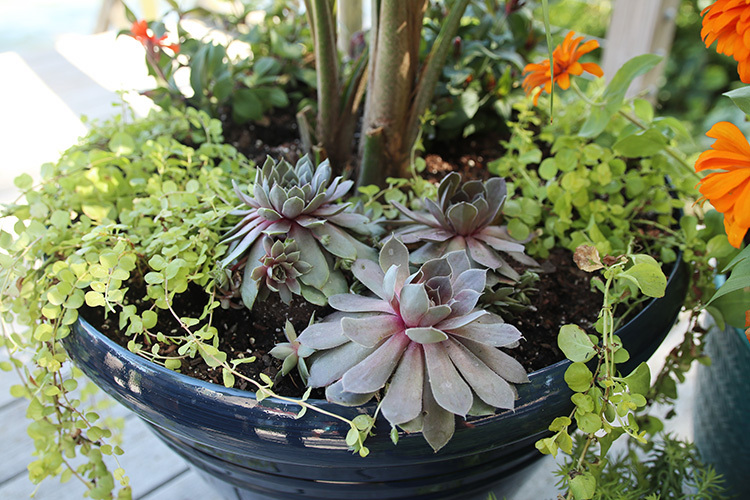 The small container provides a pop of bright green with another sedum. I couldn’t be more happy with how this deck turned out. 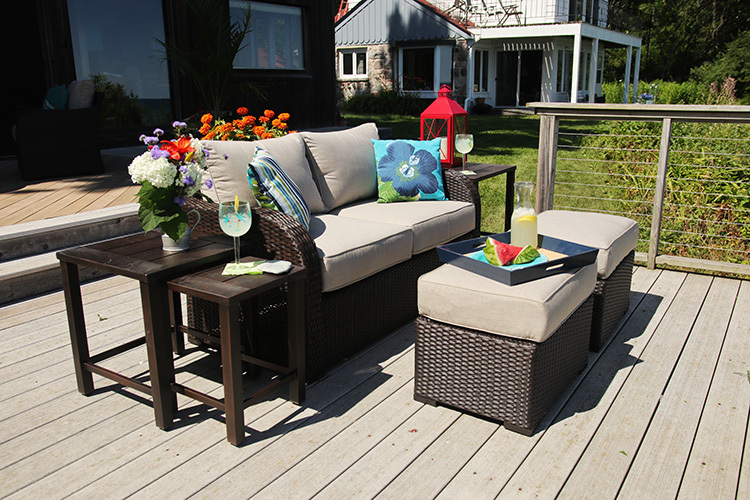 With comfortable, versatile furniture it’s now a place for all of us to linger a little longer enjoying those precious summer moments. And the best part is that I did it all as surprise, so the next time extended family shows up they’ll be greeted with a whole new look. But they better make room for me on that loveseat. If you’re looking for me, here’s where I’ll be. I am jealous! I am heading to our family cabin in the woods and wishing I could give it a make over. We have a big deck too over looking a river. Maybe next year I will do this! We’re really loving it, and like I said we never thought about doing anything nice out there before because it’s a cottage. But turns out that’s an even better reason to do something nice out there! Your cabin sounds lovely. 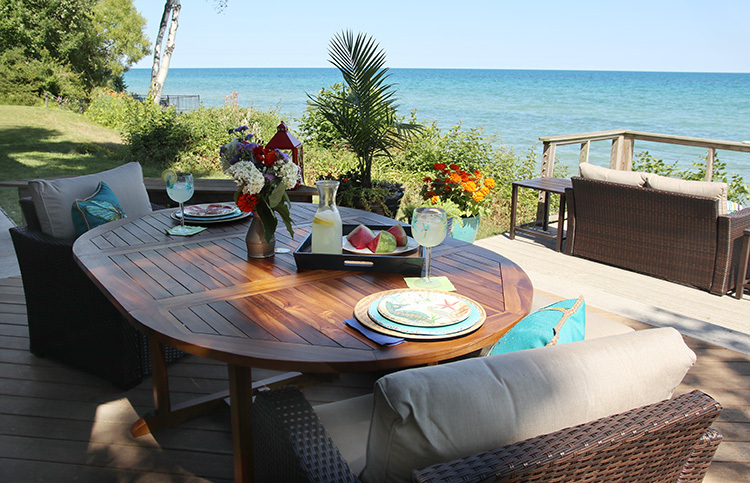 That teak table makes my heart go pitter-patter! This is amazing and gorgeous. We have a table that does not accommodate a holder on the ground for our new (last summer) umbrella. So Mark screwed the table to the deck so the table weights the umbrella in place. A crazy solution and we need a new table soon. I would like one to accommodate a crowd but mostly it’s the two of us, so that table is fabulous. Now I need to see if there is a Lowe’s in Madison. Mark is such a handy guy! This table was such a huge upgrade. And we do have a number of people who really like using an umbrella so I’m sure they’ll like that feature.